Get your Surf on! | Tinker, Tailor, Sweater, Sigh! Welcome to another Surfin’ Sunday! I have been looking for granny square patterns this week. In particular, something fun, funky, unique and different than the plain jane square we all recognize. Here are a few I really liked. 1. 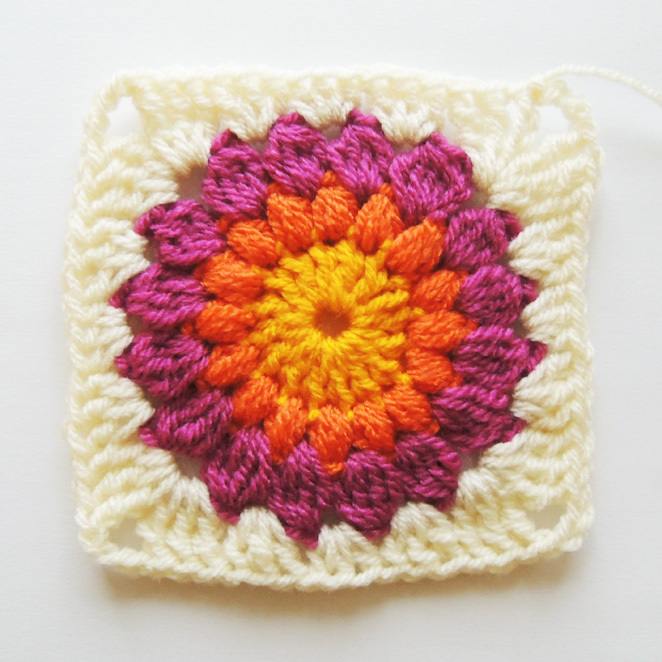 Sunburst Granny–there are a few places to find this lovely circle inside a square. First up is nittybits who has a wonderful written tutorial with picutres. Look at the gorgeous colors! Didn’t she do an amazing job!?! Bella Coco has a Youtube tutorial, for those who prefer to watch a video, using nittybits pattern. Bella uses UK terminology, but mentions US versions as well. If you want just US tutorial then try Wooly Wonders Crochet on Youtube. Priscilla’s Crochet also has a version of the Sunburst Granny that would make a wonderful afghan. I started one yesterday, and I love how it looks so far. It works up quickly. I made one change which was to do a magic circle with the double crochets in the center. 2. Patroon Granny Square–Yes, this blog is in a foreign language, but the photos are clear and you can translate it. I love this square! It is colorful and I love the loops inside. There are other gorgeous and free square patterns on this webpage so be sure to look them over. 3. 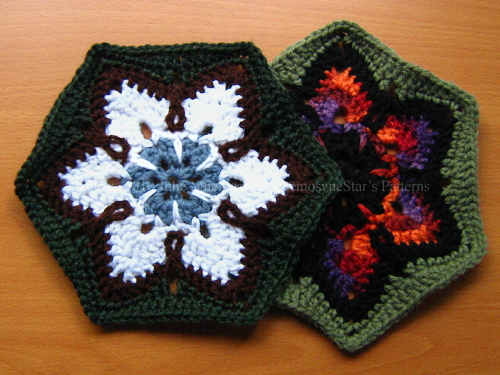 Starflower Hexagon by Julie Mnemosyne is a stunning square! You can get this free pattern on her Ravelry page. This is on my top 5 to try list. Love it! 4. Another one on my must try list, Linda’s Snowflake potholder square aka Snowflake granny square. The Crochet Crowd has the Dusty Snowflake square. Red Heart has the Snowflake Throw. 5. Celtic Knot Square looks amazing and I wonder how difficult it is to create. 6. Just look at this lovely Rose Granny Square! It is based on the Babouska Rose blanket. I love making flowers, so this one is right up my alley! 7. One last square for today, the On the HUH square by Tiggerbee. I found an extremely colorful version on Pinterst. Imagine the color combinations you can work with your scrap yarn on this one! So there you go, lot’s of atypical granny squares to get you started! ← Previous Post My second Finished Friday! Next Post → Wacky Wednesday!